1. Coat a large nonstick skillet with cooking spray; place over High heat until hot. Add spinach and saute 4 minutes. Stir in ricotta, parsley, 1 tablespoon basil and parmesan. Season to taste with salt and pepper. 2. Coat a medium skillet with cooking spray. Saute onion and garlic until tender. Stir in tomatoes and sauce. Simmer 15 minutes, stirring occasionally. 3. Remove pan from heat and stir in remaining basil. To assemble, place tortilla on a work surface. Spread on 1/2 of the cheese mixture; place second tortilla on top, spread with remaining cheese mixture, cover with third tortilla. 4. Place lasagna"" triangles on a baking pan sprayed with cooking spray. 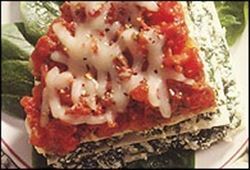 Top each with tomato sauce, sprinkle on the mozzarella cheese and bake in a 425 degree F oven until heated through (about 10 minutes). Enjoy this delicious veggie lasagna Mexican recipe!